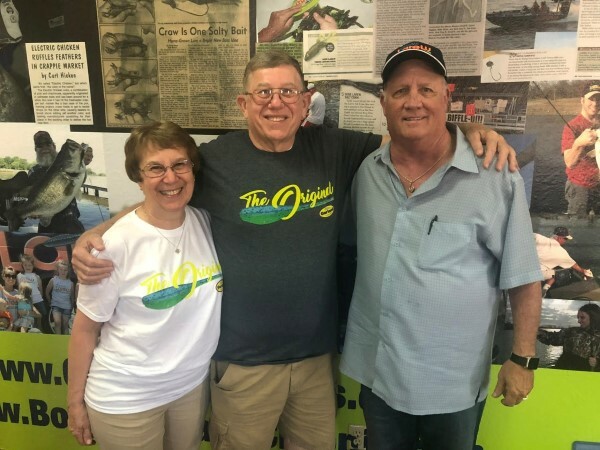 Jeanne and Tim Huffman with owner/president, Chris Lindenberg. 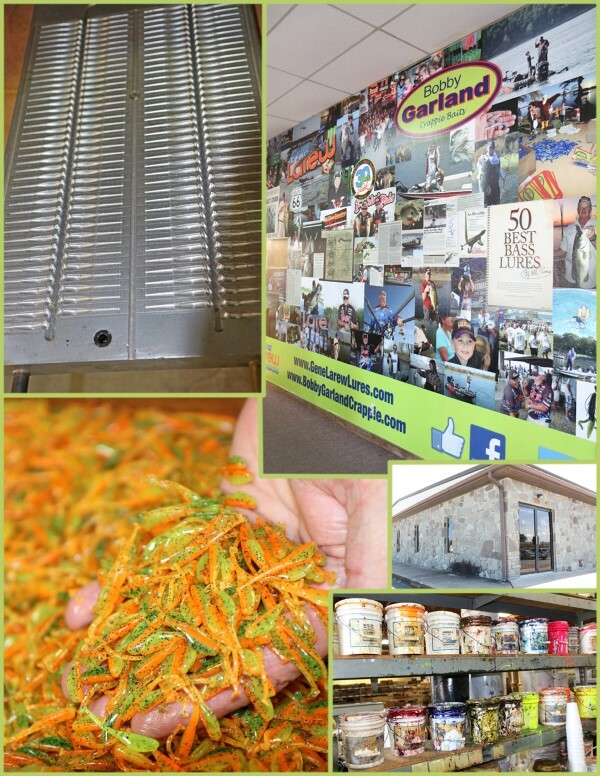 Chris Lindenberg, owner since October 2006, says, “In the beginning it was tough having to reestablish the name, product, quality and consistency, but over the years we have solved problems, created great customers and grown. I’m finally learning to relax and enjoy the ride. The Baby Shad mold creates 158 baits per pour. It takes 36 hours to go from plastic in a barrel to packaged baits. The #1 selling color for crappie is Monkey Milk. All Bobby Garland plastics are made in the USA. The following are highlights from Lindenberg about the bait-making process. One. Plastic arrives in drums in three grades: soft; medium and hard. Two. Lure type is decided including whether it will be a solid color, laminate or a front-back color. Three. For two-color baits, a gated mold is used to open the gate at the precise time to allow the two colors to run together for a front-back colored bait. Four. The color recipe is loaded into the tank. Pressures and temperatures are checked. Plastic temperatures are set at 380 degrees. Five. The mold is poured with plastic. Crappie molds often produce over 100 baits per pour. The mold is chilled down to where the plastic can be handled, about 30 to 50 seconds. Six. The plastic is pulled from the mold by hand. It’s cooled and allowed to harden for 24 hours. Seven. Each bait is individually picked (pulled off) the poured plastic. Eight. Baits are packaged and shipped. Other notes: Left-over plastics can be ground, re-melted and used; baits are quality controlled three times, when they come out of the mold, when picked and when packaged; the company will be going from six machines to ten by the start of 2019. Their crappie bait lineup includes: Baby Shad; Baby Shad Swim’R; Little Bit Swim’R; Scent Wiggler; Crappie Shooter; Little Bit Slab Slay’R; 2” Slab Slay’R’; 3” Slab Slay’R; Minnow Mind’R; Slab Doct’R; Split-Tail Minnow; Pile Diver; Slab Hunt’R; Stroll’R; Swimming Minnow. Jig heads include: Crappie Pro Head Doct’R; Mo’Glo; Overbite Sickle; and Bobby Garland Itty Bit. Accessories include: Crappie Rattles; Dock Shoot’R Pull Tab; Slab Ticklers; Mo’Glow Slab Jam. 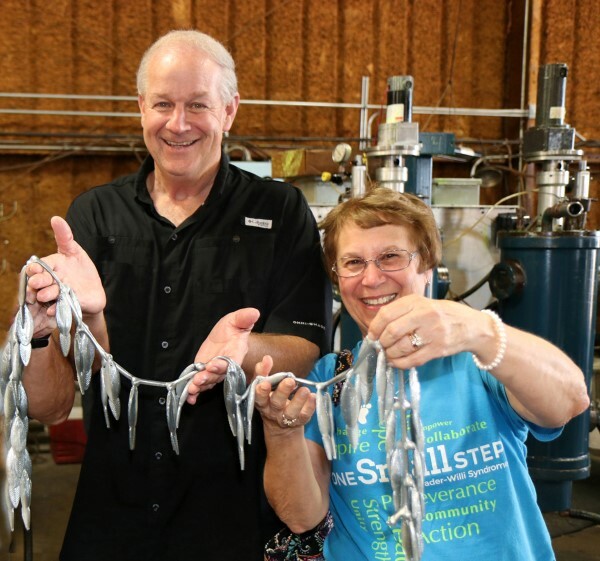 Gary Dollahon and Jeanne Huffman display a stringer of fish; Oh wait, that’s a pour of plastic baits after they come out of the mold. 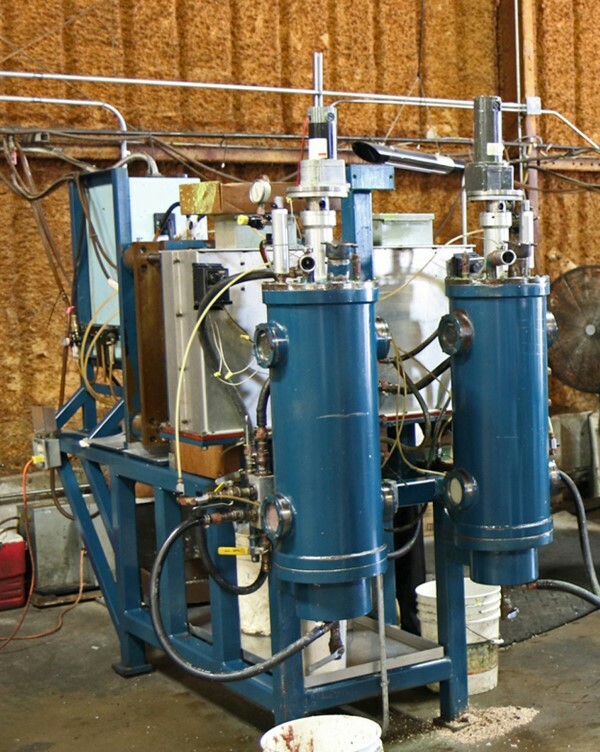 The machine where plastic, colors, mold, vacuum, pressure, heating and cooling all combine to form plastic baits.